Following an incident where two people were wounded, one very seriously, police have arrested two taxi drivers on suspicion of wounding, questioned them and released them on bail. Rochdale council have temporarily suspended those taxi drivers licences. It seems correct and common sense to do that, so, why are so many taxi drivers protesting? Given that hasn't been a comprehensive report regarding the circumstances of this 'affray' we must assume that the two taxi drivers, both bailed, have given their side of the story and that the police are satisfied, for the time being, that they pose no further danger to the public and thus have been freed. As these men earn their living (rather important to them I should imagine) driving private hire cars it behooves that such should be removed in this manner and by faceless bureaucrats. Who picks up the tab now? You do. Benefits etc etc etc. This action should only be taken if and 'when' the drivers are found guilty of an offence which breaks the conditions of their license. Such is not the case - as yet. I would imagine they may well have a case for damages against the issuing authority which if pursued could in the end result come out of YOUR pocket yet again. Time someone got a better 'grip' in the town council - another knee-jerk reaction by another 'knee-jerker'. I thought Rochdale had enough of those already? The fact that these men have been conditionally bailed does not put them in the clear, we have several men suspected of grooming charges walking around Rochdale on bail. Having said that, we don't know the facts, but I don't think the council will have removed their licences 'on a whim' but, presumably (or should I say hopefully), the true facts will emerge. R.M.B.C. explained the temporary suspension of licences takes into account both the nature of the alleged incident, and the conditions of bail. With a young man in hospital in critical condition, if the council had not taken the action, it would be dereliction of duty. This protest does not reflect well on the taxi drivers of Rochdale. About 2 months ago, I witnessed a local taxi driver bullying a female PCSO near my local Primary School because she had requested that he did not park his 'people carrier' outside the school (along with other offenders). They all acknowledged her request, but he instantly objected to this request and became extremely aggressive and, at one point, he parked his vehicle round the corner and returned on foot to verbally abuse and intimidate the PCSO to the point he had her up against the wall with his finger in her face. I and fellow neighbours wrote statements about this incident and I believe they took his licence off him because....this wasn't the first time he had been up before the licencing team for similar behaviour and had been warned previously. I, for one, would not wish to climb into any taxi driven by someone with the potential to lose control in this manner resulting in the unleashing of such anger/aggression. Superposition and assumption inadeqaute - for unless these two men had some previous we have not been informed of then it leaves us all open to the machinations of the bureaucrats. I prefer to wait and see. The machinations of bureaucrats, or the mercies of Rochdale taxi drivers, which to choose? Probably neither, but not everyone can drive and afford to run a car. A taxi service is a necessity but has to be properly controlled. cyfrifia wrote: The machinations of bureaucrats, or the mercies of Rochdale taxi drivers, which to choose? Probably neither, but not everyone can drive and afford to run a car. A taxi service is a necessity but has to be properly controlled. 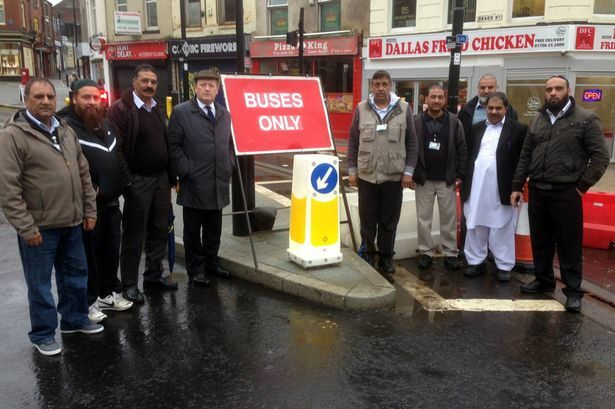 The owner of Streamline taxis, Mohammed Razaq, has said about 60 drivers took part in the demonstration. He also reported in the M/C Taxi News that the two drivers had not been arrested at the time “on suspicion of “Section 18 assaults, which are very serious . Perhaps he’s confused. With this power-show from private hire drivers, will the victims or any witnesses feel confident in giving full accounts, or will they feel too intimidated by this demo, this ‘show,’ and the other drivers’ machinations? While inquiries are ongoing, the council has temporarily revoked two taxi licences on a temporary basis. Many in the community may see this as reasonable precaution, when taxi drivers are relied on as safe passenger custodians. Of course, if lesser charges result, the GMP serious crime figures will benefit, but exactly what do people want from the police and local enforcement – investigating and solving crimes, or not? There's justice and there's 'JUSTICE'. Heavy handed justice can be a catalyst for crime itself whereby 'knee-jerk reactions' produce disquiet or a feeling of injustice which in itself can provoke a backlash. I see no reason to deprive people of their 'livelihood', however temporary, without a very good case to do so - and I consequently don't feel happy about this case given the present evidence provided to the public. I deplore this 'sanction to cover one's backside' actions so rapidly enacted these days. Smacks of cowardice on the part of the people so concerned. I owned taxi firms in Rochdale and I know just how provocative and downright rude young men, exiting pubs in less than good condition, can be. I reserve my judgment for better information on the circumstances - and my condemnations. Life goes on, taxi services are essential, but everyone has to live now with the consequences of the grooming scandal. If a closer eye had been kept on the activities of Rochdale taxi drivers in the past, a lot of heartache could have been avoided. I don't disagree. But to tar them all with the same brush is another 'knee-jerk' reaction. There are good and bad everywhere. Each man must be judged individually should such be necessary - not as a group. I don't like lawyers and bankers but I don't condemn them per-se or reach for the cloak of 'self-preservation-best cover my bum' when one or two of them 'appears' to have been naughty boys. There's far too much cowardice in our society today instead of demanding the rights of 'innocent until proven guilty'. It does us no credit - in fact quite the reverse. To temporarily suspend the licenses of taxi drivers who are out on bail under suspicion of a serous violent crime either is normal procedure, or, if it isn't, it should be. If every employer took that attitude regarding their employees it would cost us all an arm and a leg. Get real. The council is not the taxi driver's employer, the council is the licensing authority. Ha ha. I expected you to come back with that one. Nice to know I'm not disappointed - however -. Not their direct employer but in a position to terminate their employment nevertheless by a withdrawal of 'permission' to work in their present sphere of employment. Where's the difference regarding them making a living? We can all 'look around' for something else to do if needs must, but how would you like your livelihood to be removed tomorrow by some faceless bureaucrat at his or her whim???? Try the suit - see how it feels? I would need to know a lot more regarding the 'facts' of this 'fracas' before I would even consider such a sanction. Which I might add should NEVER be taken lightly. You know cyfrifia, you seem to have a 'down' on taxi drivers. But before you take such views perhaps you should consider the situation on the ground. A job that requires working very unsociable hours for small remittances will , by its very nature, attract the fringes of the work force. Those that are 'free' to work as and when called upon to do so, at any time, in any given situation, for any length of time. Because of the work conditions it tends to attract unmarried, divorced or otherwise less tied young men some of which will prove to be unreliable in other spheres - and thus - not the best of society's output. The same could be said for 'take-away' employees from which some of the same ilk 'spring'. To 'change' the nature of the 'job' to one where there are guarantees that all the employees would be of 'exemplary' character and thus 'safer' would require a sea-change' in the very nature of the work involved - and I might add not an inconsiderable cost to the end product i.e. the money you pay for the service. You are not dealing here with anything other than a product of society's ills and misfortunes as the society strives to accomplish a decent level of living in a 'dog eat dog' situation. Which is why I say - get real. It is what it is. An unsatisfactory situation that will only change as and when society itself changes. Meanwhile we have to put up with those 'odd' ugly incidents that rear their ugly heads. Atlas wrote: how would you like your livelihood to be removed tomorrow by some faceless bureaucrat at his or her whim???? Try the suit - see how it feels? You jump to conclusions, Atlas, that suit is quite familiar thankyou. Atlas wrote: You are not dealing here with anything other than a product of society's ills and misfortunes as the society strives to accomplish a decent level of living in a 'dog eat dog' situation. Which is why I say - get real. It is what it is. An unsatisfactory situation that will only change as and when society itself changes. We don't know the whole story of the incident on 1st December, which left one man in 'critical condition' and led to temporary suspension of the licenses of two taxi drivers, on bail until 21st Jan.
You and the Rochdale taxi driver's lobby oppose the temporary suspension of licenses. From what we do know, it seems reasonable, I would think it's either normal procedure, or should be. Attitude of taxi drivers is quite high profile in setting the ambiance and mood of a town, if they are relaxed, friendly and reliable it sets a good tone. P.S. In Burnley, 26 unsafe taxis have recently been taken off the road and three taxi drivers lost their taxi licences altogether. Having read your link Cyfi, I scrolled down to the comments/responses .... don't they speak volumes on just what 'Joe Public' feels! in particular the lamentable comments made by the chairman of Burnley Private Hire Association. Quote:"the car can be taken to the garage and fixed" - well of course it can, but meantime some innocent passenger/s may not be so lucky! I have no problem whatsoever regarding the safety of the vehicles and the suspension of the licence if the driver in question has a record of non-compliance with the regulations. This is not the same situation we are discussing. IF the council has a clause in its agreements that drivers who are arrested and charged with a violent offence are immediately suspended or revoked of their licence, then again I have no problem with that. Otherwise - I hold with my previous statements. It's a fine line and requires somebody with intelligence and a brain. Not something councils are often equipped with. I am only too well aware the condition of many taxis, especially private hire (which in my day were not regulated at all). It is a tighter ship these days but I would question the 'overseeing' and would not be surprised to find it 'inadequate' in many respects. It is what it is - moderately fit for purpose. IF the council has a clause in its agreements that drivers who are arrested and charged with a violent offence are immediately suspended or revoked of their licence, then again I have no problem with that. That is the heart of the matter, do such terms and conditions for temporary suspension of licences exist, or, is it down to 'discretion', and whose discretion is that? I have responded concentrating on my own specific areas, blind person with a guide dog, and await a response. If you read the documents an outline of what is expected of all taxi drivers, Hackney also, becomes a little clearer. If you feel specific ‘rules’ regarding suitability of drivers under bail conditions then, if no such rule is in place, why not send in your views to the authority. I think it's called getting involved in running the council, a trait which should be encouraged, by inputting your views, in RMBC if nowhere else. Have read the proposals and have only one comment to make - if policed properly the county will have zero taxi drivers within one year. But of course it won't be. It will rely on the odd infringement coming to light and action being taken in a retrograde manner - in other words - the rules are there and if you are unlucky enough to get 'caught out,' you will suffer the consequence. Well intentioned but unenforceable in the wider context. But at least the Council are now being seen as taking some action towards 'trying' to make things better and safer for the general public. I would have expected nothing less - nor more. Are all taxis equal, or are 'public hire' taxis that have to meet regulations better than 'private hire' cars? Councillor Mohammed Zaman of the Rochdale Borough Multi-Agency Racial Harassment Forum says private hire cars are being discriminated against.